The Kaplan School of Postgraduate Studies was established to serve the growing demand for Postgraduate programmes in Singapore and the region. With an evolved education demographic, more individuals recognise the need to upskill for more effective management and leadership in a rapidly evolving business landscape. Since its inception, the Kaplan postgraduate network has grown to over 4,000 strong*. We provide the platform for our postgraduates to connect with one another to foster business ties, access career opportunities and broaden their professional networks. The Kaplan School of Postgraduate Studies offers one of the most comprehensive range of programmes to cater to different individuals’ interests. The School’s myriad of postgraduate programmes include MBAs, Executive Master’s, Specialised Master’s Degrees, Graduate Diplomas and Graduate Certificate programmes. Regardless of your current profession or future career aspirations, the Kaplan School of Postgraduate Studies has the right programme to suit your needs and propel your business or career to the next level. The School boasts strong partnerships with seven renowned universities from Australia, Ireland and the UK, with over 30 postgraduate programmes spanning 6 main disciplines. Many of our university partners hold accreditations or recognitions from esteemed professional bodies, such as the AACSB, AMBA, EQUIS, ACCA, CPA Australia, ISCA, SAC, and many more. Understanding the demands of today’s leaders, our programmes are delivered by either 100% fly-in faculty, local lecturers, or a combination of both, and via online to ensure learners receive the most out of today’s global best-practices. To best serve the need of every student, assessment methods range from research-based assignments and projects, to examinations. Disruption has become prevalent across different sectors, particularly in education. This has redefined innovation in learning. As part of Kaplan’s DNA to continuously transform and innovate to benefit our student learning, we have invested in the creation of Synergy Pods – Classrooms of the Future. 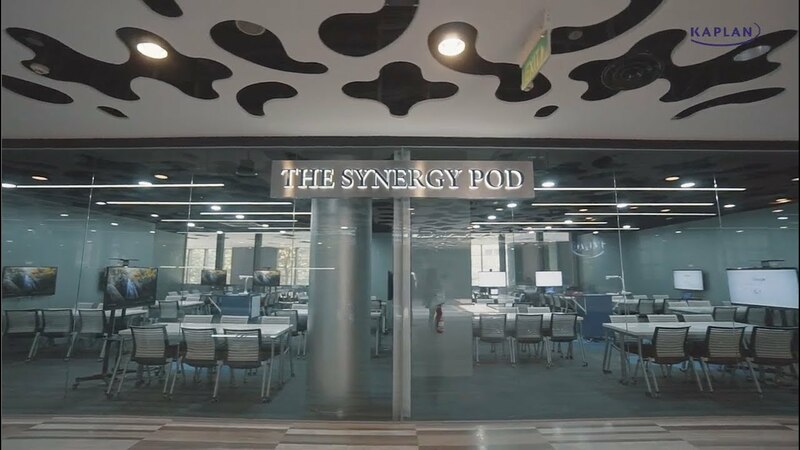 Designed and built to deliver the best possible postgraduate learning experience, every Synergy Pod is a comprehensive blended learning platform that combines effective classroom learning methodology with technologically-mediated resources, to enhance every student’s learning experience and engagement. These modern classrooms were built in mind to encourage teacher-student discussions and peer-to-peer collaboration, providing a dynamic, interactive and immersive learning experience for students.